In my hometown of Stockton, there was a restaurant that was an old style quintessential steak house. Classic steak dishes with an Italian flare. Dimly lit with candles on the tables, a waitress with a transparent beehive and a smokers rasp, was likely your server. This place, was called Stockton Joe’s. My dad loved this joint, we all did. It was a special occasion thing, definitely an adult restaurant, it felt special just being there. If it was a true special occasion, I might have gotten their signature dessert, the chocolate mousse. It was served in a tall, skinny, footed glass and eaten with a long teaspoon. This treat tasted as decadent as it felt to be allowed to order it. I decided a while back that I wanted to make a dark chocolate mousse and had found a couple recipes that I was going to take from… I wasn’t inspired, though. So, I waited. Some time passed and my pomegranates came in. Inspiration struck! I was going to add the flavor of these beautiful fruits to my mousse! The result was incredibly rich, over the top, decadence. I served it in these straight sided contemporary champagne flutes, but trust me when I say that the serving was FAR too big. Next time, I will serve it in cordial glasses. 1. 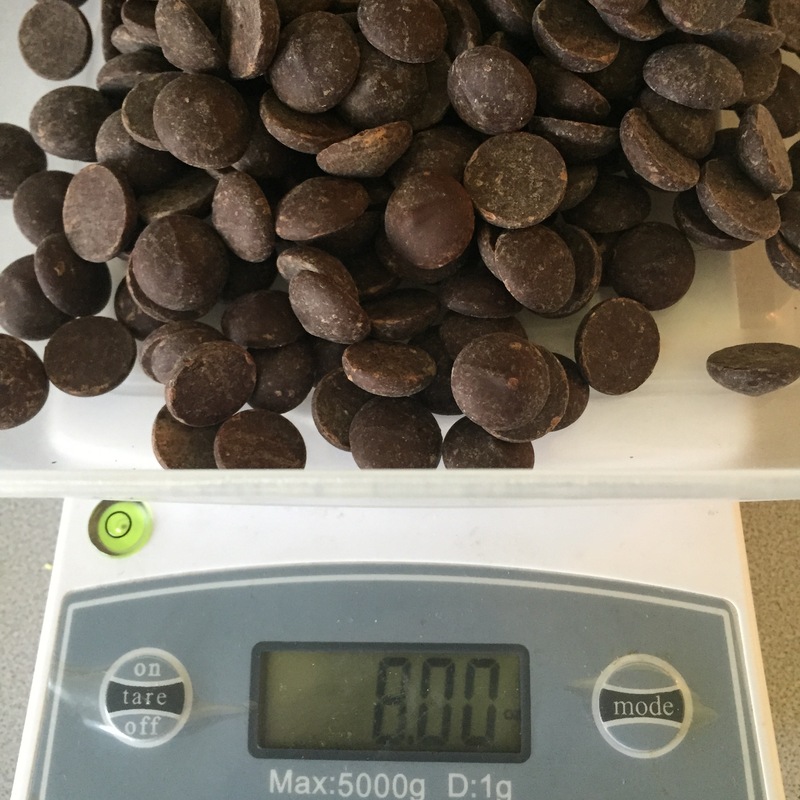 Combine the chocolate, pomegranate juice, cocoa powder, Cointreau and espresso powder in a medium bowl. Place the bowl over a small saucepan filled with an inch or so of water set over low heat to make a double boiler. Stir the mixture frequently while the water simmers, until it is completely melted and smooth; remove the bowl from the heat. 2. In a large bowl, whisk together the egg yolks, 1 1/2 tsp of the sugar and the salt until it is slightly thickened and pale in color, about 30 seconds. Pour the melted chocolate mixture into the egg mixture very slowly while whisking. If you add the heated chocolate too fast you will scramble your eggs. Allow to cool to slightly above room temp. About five minutes. 3. Whip egg whites in a stand mixer with the whisk attachment on medium speed until foamy, about a minute. Add the remaining 1 1/2 tsp sugar and increase the speed to medium-high. Continue to whip until soft peaks form, about 1 more minute. 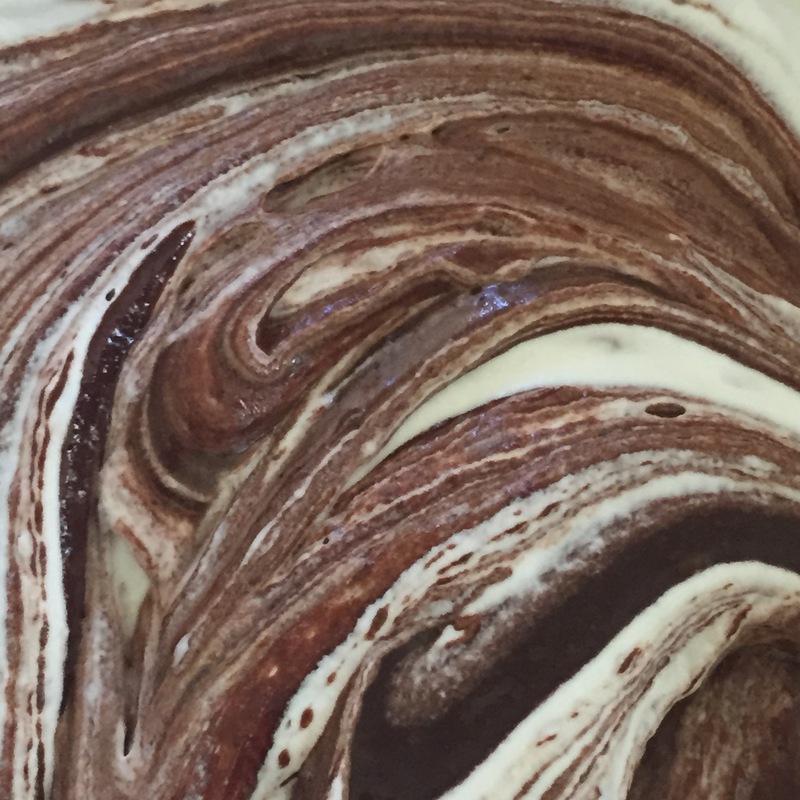 Gently whisk one-quarter of the whipped egg whites into the chocolate mixture. 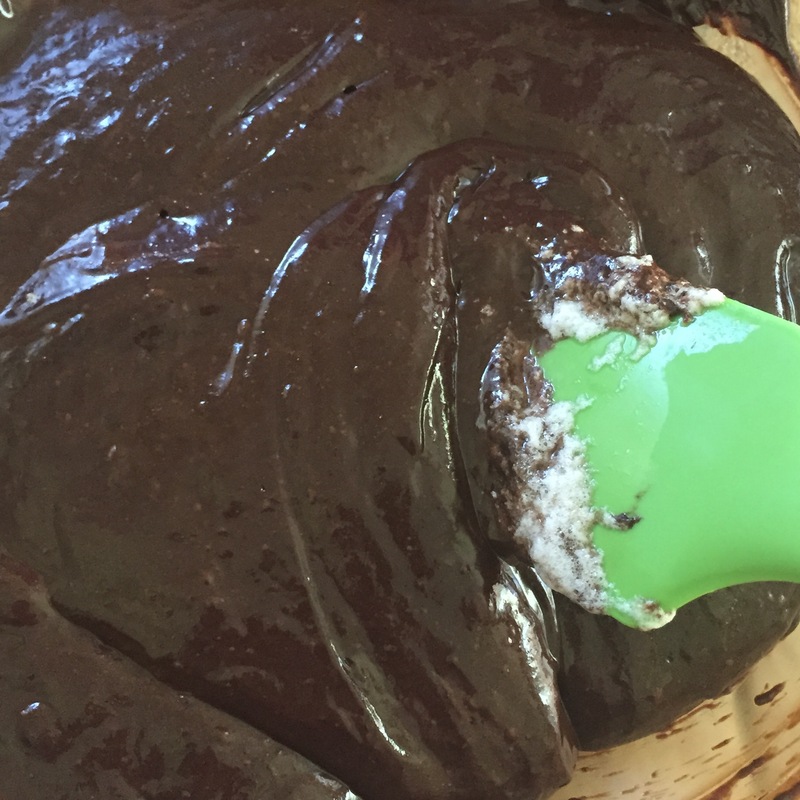 Add the remaining egg whites and gently fold into the chocolate mixture using a rubber spatula until just a few white streaks remain. 4. Wipe out the mixing bowl and and place it and the whisk attachment into the freezer for 15 minutes or so. Add the heavy cream to the frozen bowl. Whip the cream on medium speed until it begins to thicken, about 30 seconds. Increase the speed to high and whip until soft peaks form, at least another 15 seconds. Using a rubber spatula, gently fold the whipped cream into the mousse until no white streaks remain. 5.Spoon the mousse into individual serving cups, cover with plastic wrap and refrigerate until set and firm, at least 2 hours. 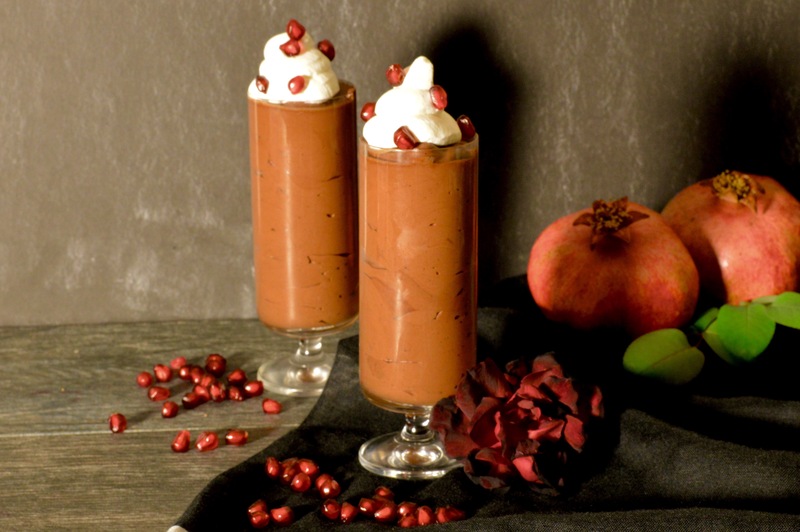 with unsweetened whipped cream and a few pomegranate arils prior to serving.